In late summer 2018, I raised a batch of Freedom Ranger meat chickens on a newly formulated no-soy feed ration from The Fertrell Company. The intent was not to make a choice between my existing feed and the new feed; the objective was much simpler. Evaluate the overall experience and collect some feed benchmarks for Fertrell. Jeff Mattocks, Fertrell, has been working on improving productivity of the no-soy feed rations for pastured poultry growers. In Issue 106 of the Grit, I detailed my experiences using a recently formulated no-soy protein crumble that I fed to a group of Muscovy Ducks. That protein crumble became the basis for a related product called the Homeowner Collection, which includes the complete ration minus the energy. In this trial, I fed the Homeowner Collection. The Homeowner Collection uses the new no soy feed formulation, but the personal appeal is the ease of mixing. For growers who do not have the scale to get custom feed or who are geographically isolated from accessing specialty feeds, this option essentially creates a two-bag mix that can be easily combined by anyone. To balance the ration, you add an equal amount, by weight, of the premixed protein blend with an energy source, such as corn. For example, to make 50 pounds of starter, I combine 25 pounds of the protein concentrate and with 25 pounds of cracked corn. I started with 63 male Freedom Ranger chickens and slaughtered them at 61 days. Even though I would not be doing a side-byside trial with my normal feed, nine weeks is the typical timeframe that I would raise a Freedom Ranger. I lost two chicks during the brooding phase. The flock consumed 200 pounds of a 21% starter and 601 pounds of an 18% grower ration. To mix the feed, I combined a 25 pound bag of premixed protein blend with 25 pounds of certified organic corn in a barrel. I used my old hand crank ice auger to mix the feed up. • Total Feed: 801 lbs. Regarding the yields of the birds, three of the birds dressed under two pounds (1.48, 1.51, and 1.97 lbs.) Outside the context of the trial, these birds would have been culled earlier in the grow out as they were readily apparent runts and never caught up to the rest of the group. Approximately 20% (12 out of 61) of the batch dressed at less than three pounds. Twenty percent of the batch dressed out greater than 3.6 lbs. As the protein blend was transported and then mixed, the crumble (which is first manufactured as a pellet) broke down into a fine powder. Naturally, the chickens did not want to eat the powder. Early on, this created waste. To compensate for the fines, I would withhold feed until they ate the fines, which they almost always eventually did. 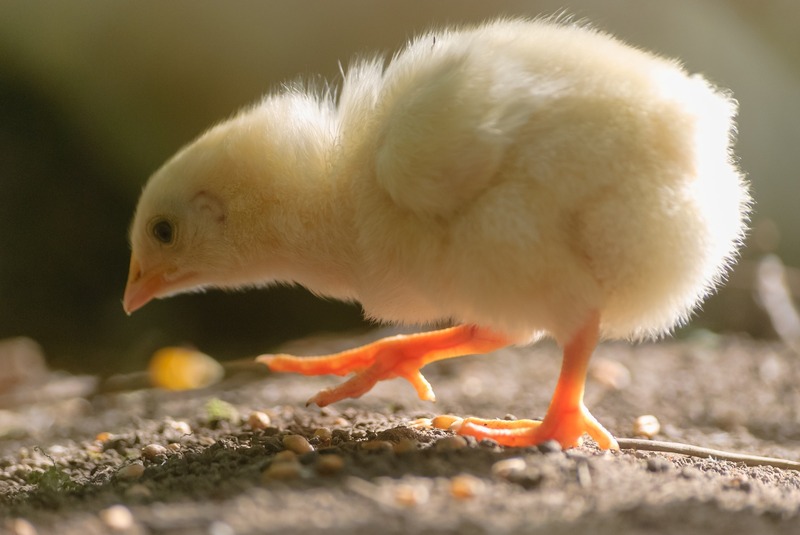 However, the constant battle of getting the chickens to eat the fine powder while temporality limiting the amount of new feed likely negatively impacted the final yields of the flock. Jeff Mattocks, The Fertrell Company, informed me that he was working on the powder issue, but powdery feed is a standing issue with all no-soy feeds. There was ultimately an ingredient that was hard to form into a pellet and that caused the whole thing to break down. The Freedom Rangers were brooded for 28 days starting July 18. The extra time in the brooder was due to excessive rain and wet fields. The rainy weather never really subsided during the trial. In the shelter, they were moved daily in a pasture shelter. After completing the batch, there is little doubt that the no-soy formulation and premixed concentrate can grow a healthy bird. The flock was well feathered, there was low mortality, and the birds had an appropriate amount of fat on them. The powdery nature of the no-soy feeds complicated feeding. However, the final feed conversation of 4.1 pounds of feed to one pound of ready-to-cook chicken is in line with my expectations. I’m not ready to switch to a no-soy feed, but knowing that I have a reliable source of no-soy feed for small batches of 50 to 100 birds that I can easily mix is my important outcome for this feeding trial. The Fertrell Company blog is for farmers, backyard gardeners, and homesteaders alike. Learn from the experts on all things natural and organic for both soil and livestock. Your trusted partner; creating superior products for healthier soil, plants and animals. Healing the earth and feeding the world - Better Naturally!